One of the primary forces in the early population of the settlement at Moreton Bay was the Reverend John Dunmore Lang, a Presbyterian minister born in Scotland who emigrated to Sydney in 1823 to join his brother who had arrived there earlier. Their parents joined them in 1824. After comparing poverty in Britain with potential in New South Wales, Lang set about promoting the idea of emigration to Scottish tradesmen and their families. He also commenced to lobby for funds to provide assisted passages for them in order to further advance the cause. Even then, government was another name for bureaucracy, and Lang was quickly frustrated by the ponderous processes involved. Initially praised for bringing such suitable free settlers to the colony, Lang then was censured by the colonial government for his frequent criticism of it. However, Lang kept travelling back and forth between the old country and the new, proselytising about the colony and doing his best to attract free settlers. One of his principle reasons for doing this was to reduce the immorality that he feared would overtake a colony that consisted largely of convicted criminals. In 1848, a shipload of emigrants recruited by Lang left England for Moreton Bay. It contained around 250 people who were about to start a new life, aided by a grant of free land which they would receive on arrival. That ship was the SS Fortitude, pictured below. Unfortunately for the new arrivals, a mix-up in communication between Lang and the English under-secretary for the colonies meant that no such land was forthcoming. The new chums were forced to camp out in a valley north of Brisbane near Bowen Hills, and the area slowly became a settlement in its own right. 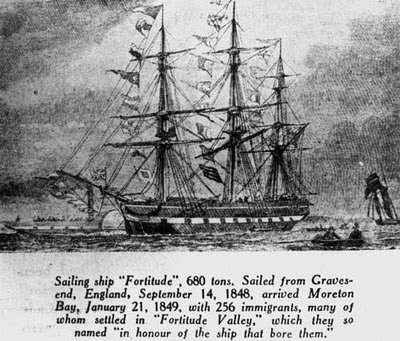 It became known as Fortitude Valley, named after the ship, but also symbolic of the main characteristic of the settlers. 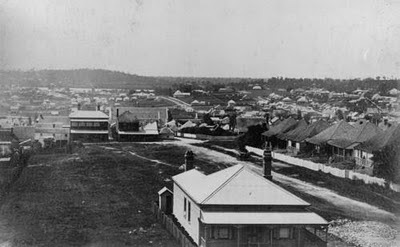 Here is a photograph of the area from a bit later, around 1882, when little workers' cottages had started to pop up. The building in the centre of the picture is St Patrick's Catholic Church. The houses that were being built were different from the houses back in England and Scotland. The hot and humid climate required that buildings be adapted to cope. Stone and brick were expensive and hard to obtain, while timber was plentiful and easier and quicker to work with. Here is an example of a Fortitude Valley house from 1888, in a style we refer to as a Queenslander. 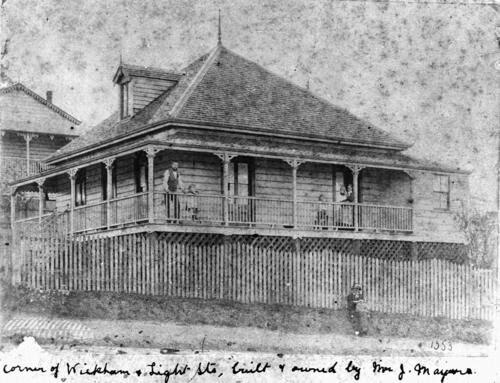 This house was situated on the corner of Wickham St and Light St, an area that later became a Brisbane City Council tram depot. The defining charactistics of the Queenslander are: steeply sloping roof to disperse the tropical downpours; extensive, wide, covered verandahs to shield the walls from the sun and provide breezeways; and the house was raised off the ground to allow cooling breezes to flow through underneath, reducing the temperature inside the house. For more information, have a look at one of my favourite blogs Art and Architecture, mainly. Or here, where brismod is renovating her "sow's ear" Queenslander! Fortitude Valley has changed over the ensuing years. It became the first commercial area north of Brisbane Town, and then as the population expanded, a central transport hub. By the time the twentieth century rolled around, it boasted all sorts of commercial ventures including department stores. The picture below shows the intersection of Brunswick St and Wickham St, with Waltons department store on the left and McWhirters on the right. The trams that crossed this busy intersection were controlled by a man in the little box in the centre of the picture. Just wanted to say I've recently found your blog and am really enjoying the regular updates. Great to see Brisbane's history being brought back to life!